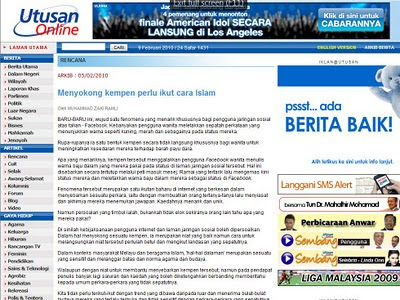 My second article entitled Menyokong kempen perlu ikut cara Islam was out in Utusan Malaysia on 5 February 2010. That makes the third time my articles were selected to be posted in local mainstream newspaper since I started working and it was another achievement in my career with Yayasan Ilmuwan. Basically, the article was all about my concern on the matter related to Facebook and the Bra Color. You can say it's the translated version of the blog entry with some additional points. May it be beneficial for the readers. akak terbaca another blog,pasal japanese loo,sooo gud and sophisticated...y don't zaki write an article berkenaan malaysia's toilet and its citizen nye attitude. way to go dude...u go man!